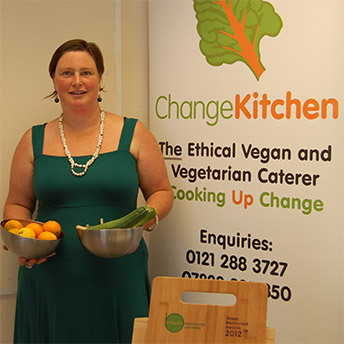 ChangeKitchen CIC (Community Interest Company), established by Birgit Kehrer, reflects her love of growing and of cooking high quality food. She provides imaginative combinations of freshly prepared vegetarian and vegan food for events. Casseroles, bakes, cooked vegetable, salads and sausages that people can’t believe aren’t meat, surprise as well as delight clients who appreciate that the food is selected and presented with both passion and care. A loan from ART supported ChangeKitchen through the challenge of losing its main customer base and needing to quickly enter new markets. From April 2010 many of the charities and social enterprises, which formed the majority of Change Kitchen’s customers, found themselves with no funding – a dramatic change brought about by deep cuts in public sector funding introduced by a Government trying to get the economy back on track following the credit crunch and banking crisis. ART’s loan helped ChangeKitchen to target and begin to make a name for itself in the wedding and corporate sectors. As its reputation spreads, the average size of bookings is increasing and ChangeKitchen is building a new customer base. The future is looking promising.